MJRP Shikshan Sansthan has come up with private university. It endeavors to focus on careers in high demand in order to promote students with an intensive education in these specialized fields. It intends to include all professional courses that will provide more and more employment facility to the students. Knowledge is gained from right education that makes a person civilized and shows his superiority over the savage. There are thousands and thousands of schools and colleges in India, the choice of where to study can bamboozle even the most savvy. MJRP Shikshan Sansthan where the marbles are carved and are made to spread their light all over the darken parts. 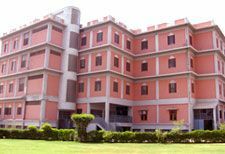 The Sansthan with various offshoots like MJRP P.G Girls College ,MJRP College of Engineering and Technology, MJRP College of Corporate Management ,MJRP College of Education, MJRP B.Ed College ,MJRP Shikshan Parshikshan Ambassy College for girls, Ambassly Millennnium School ,Ambassy School of Nursing ,Human Resource College of veterinary Science has made astonishing strides in the field of education during a short span of 16 Years, with a mission to combine a strong commitment to fundamentals with a requirement for employment.